Today, I want a river. I want to temper this desert heat with the coolness of moving water. I want to soothe myself with the sound of river music. Like a crazed emigrant having just crossed the waterless desert, let me fling myself into the sweet liquid and drink deeply. I’ve been exhausted – drained, listless. My blood feels like it is thick as mud, while my brain is in a brown paper bag somewhere, left out to roast in the sun. And, I know that my hormones, those messengers of good news, have lost their way as they migrate across the cellular territory. I can imagine them now, those little critters frantically moving from one cell to the next, tired and thirsty, and finding that is no room at the inn. I’ve been told by doctors that I should take pills. Friends encourage me to stand my ground and say “no” to western medicine, claiming the truth lies in supplements and herbs. Or maybe the cure is to be found in juicing, Tai Chi, Chinese medicine, colon therapy, or other treatments that I cannot even name. This list is long and tiresome. All I really want is a river. Just thinking about it makes me feel better. Oddly, until recently, I’ve never seriously considered my physical body to be an essential aspect of my being. I know this may sound outrageous, but, like many of us who were raised in the Judeo-Christian paradigm, I have viewed my body – that which eats, sleeps, walks – as only a tool for achieving nobler intellectual and spiritual goals. But, when things no longer function as they should, I am reminded that my body is more than just a vessel that contains feelings and ideas. Rather, it is the very landscape on which I live. I am made of earth. My skin is the dirt, my hair the sagebrush, and my blood is the river that incessantly gravitates downward, toward the great and mysterious sea. Even these thoughts that I now type onto my computer are small drops of dew that appear in the early morning, soon to be forgotten. In times of extremity, the myth of separation quickly melts away. The valley is hot today; an oppressive 106 degrees. Here in the rain shadow any moisture is welcome. 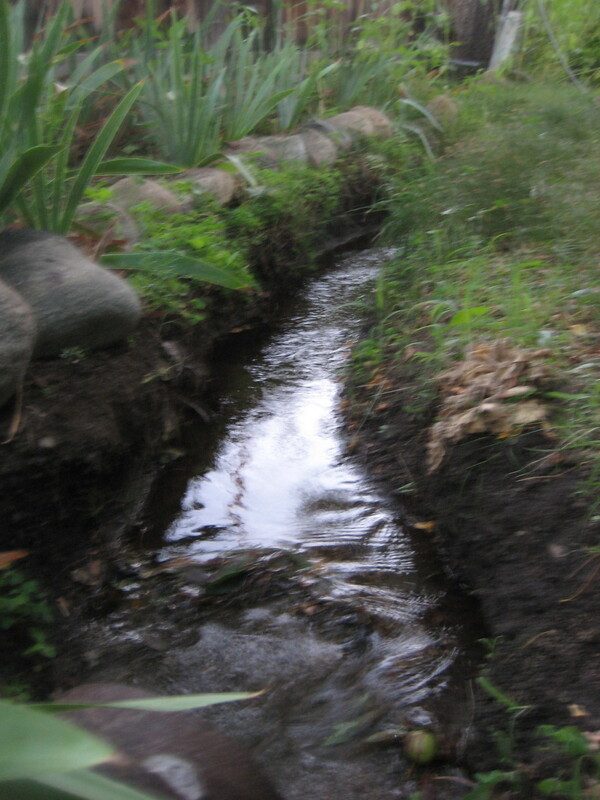 I glance down at my feet and notice the small stream that works its way through the garden. It wasn’t long ago that this one finger of life didn’t exist. 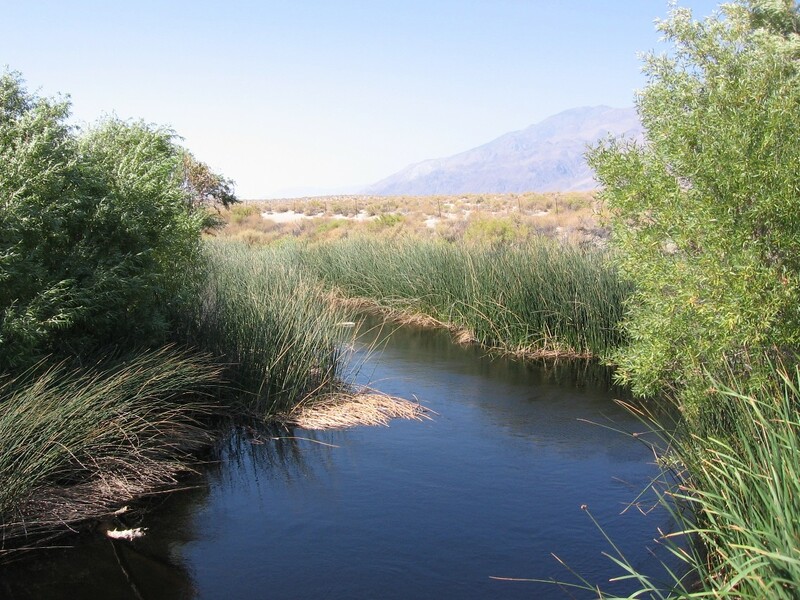 In the early 1900s, after William Mulholland and his crew completed the Los Angeles aqueduct, almost all the free flowing water in Big Pine and the nearby towns was captured and redirected to the southern metropolis. 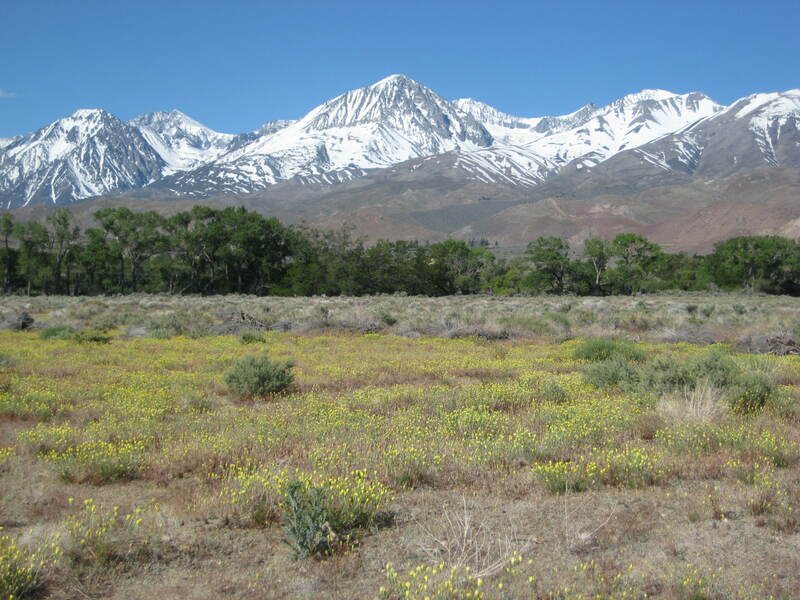 While the San Fernando Valley spouted new growth, the Owens Valley shriveled up like an overcooked zucchini. 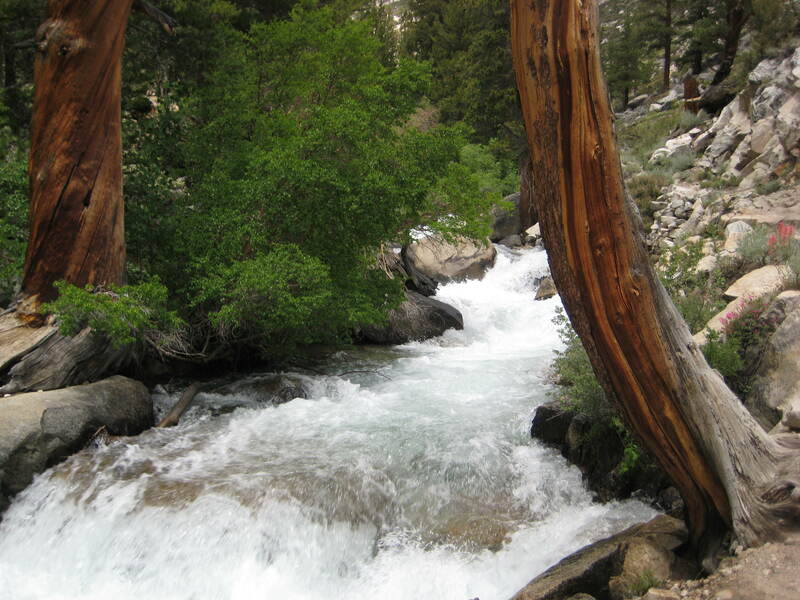 Through recent and numerous lawsuits, and the hard work of local volunteers, water flows again in Big Pine. It’s not enough to revive the valley, but the hum and tranquility of moving water adds flesh to dry bones. 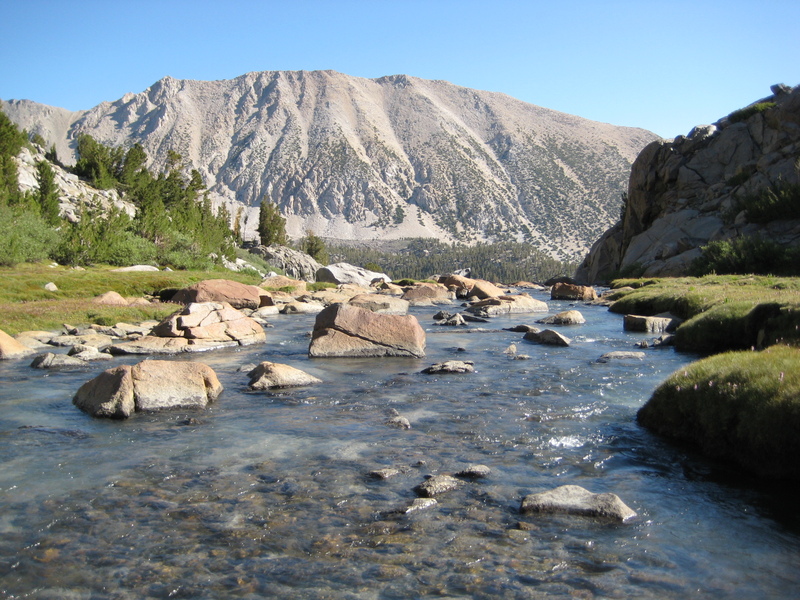 I look up to the Sierra and redirect my attention to the water’s source. Blue-grey ribbons taper down the mountains, leading up to a Glacier known as the Palisades. The Palisades Glacier is the lowest and largest glacier in the Sierra Nevada and it is melting fast under the summer sun. That is where I want to go. No question about it. Cursing the heat that sits on my head like a hot cast iron skillet, I decide it’s time to climb, to follow the cool path of water, to move closer to the source. Bernard Devoto writes, “What is the source of a river? Snow becomes water and (this is a natural law of which nearly everyone is ignorant, especially Westerners) water runs downhill. Contour levels bring trickles together, other trickles join them, and at some point enough of them have joined so that they may be designated by any of several nouns ending in – let”. Well enough. But, standing beneath this enormous glacier, I see few trickles or anything small enough to be considered a “-let”. The river here is almost immediate. A few hundred feet down it becomes forceful, uninhibited, and indifferent to my presence. It will not stop on my account. If I carelessly step in, I will be swept away without mercy. And best of all, it is wild, unconstrained by aqueducts, free to follow its own course. The river overcomes me. Something is jogged loose and broken open. I cannot see it, but I can feel the released blood gushing through my veins. I can feel each cell in my body swell up like a Beavertail Cactus after a summer rain. Whereas in the desert I survive, here I take in with no regrets. This is what the I Ching refers to as “Receptive devotion”. I am devoted to receiving. The alchemists call the eternal water – the aqua permanens – divine wisdom or intervention. Always bestowed at the crucial moment of defeat and despair, when there is nothing left to give or do except surrender, the water comes and coolness sweeps across the desert valley. It is none other than a moment of grace, this receiving. Like water, it moves that which is hard and permanent. It softens a rigid mind, erodes stone, and brings forth new life. It cannot be earned, learned, or bargained for. It is given freely. It just is. The Earth’s condition is receptive devotion. Perfect Indeed is the sublimity of the Receptive. receives the heavenly with devotion.